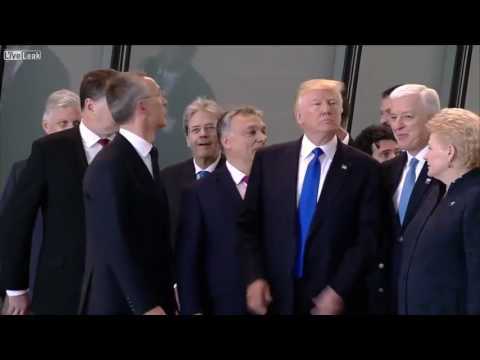 Why did Trump assault the prime minister of Montenegro? He patted him on the back, and then the PM of Montenegro smiled, so appears they are friends. How could anybody watch this clip and think that was an assault? Because Montenegro had just become a member of NATO and Putin's Puppet Trump does not like NATO. Why did Kavanaugh push his wife? Damn people are dumb. If what Acosta did is being classified as an assault what Trump did is aggravated assault. That is the reason I posted this question to see if any Trumpettes would see how ridiculous their charges of assault actually are and how they are not applying the standard to their messiah. Because he thinks he can do whatever he wants and get away with it. He does too. Hopefully someone is taking a record of all the ridiculous things he's done and will lock him up for all the lies he's told and throw away the key, in a swamp in Florida. Do you even know what assault means? I just skimmed over this article as well as your video. Trump's a nut. Who knows? Montenegro? LOL. Jerk move but what are you going to do about it? Only 61 colonizing white families own land in south africa, how is that genocide?